On my trip to Melbourne I arrived on the Monday and was scheduled to give my talk on the Saturday. Felix and I were picked up at the airport, together with another chap who was also speaking at the State of Design Festival. 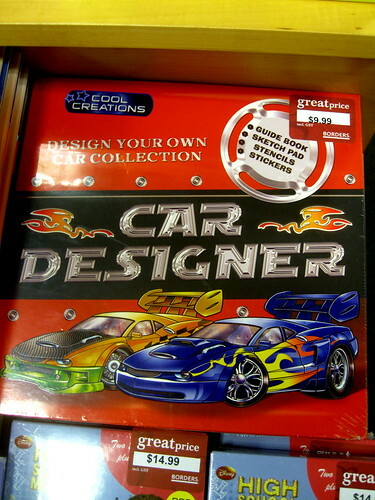 A car designer. Former head of design for BMW. His name is Chris Bangle. Charming and personable with great humour. He gave his talk on the Tuesday at the BMW Edge venue at Federation Square. I was looking forward to hearing about car design - all design is interesting to me - and it was going to be interesting to hear how the automobile industry and its designers are tackling the needs and moods of this new century. "We are becoming more aware of ‘personal mobility’, the choice we make for moving around. However, Bangle perceives the need to consider ‘personal emotional mobility’ if we are to seriously tackle behaviour change and develop more sustainable mobility products. People have developed ‘emotional’ attachments to their modes of transport, so if we want change we need to provide new experiences that act equally as a catalyst for emotional connection and sustainable outcomes." To say I was disappointed is an understatement. Sustainability and the environment were hardly mentioned. What I did learn was this funky and fresh new catchphrase created by Bangle to describe the evolution of designing cars: Personal Emotional Mobility. Wicked! Sounds lovely and hip and modern and this was the phrase around which Bangle's talk revolved. What does it mean? Well, um... it turns out it means that the car industry needs to rethink their design so that people can have a heightened emotional attachment to their cars. It's a catchphrase to describe the goal of getting people to buy more cars. "We have to hook them back to the car." That's what he said. Sitting in the audience it was remarkable to see how many people turned their heads to the person next to them with quizzical looks on their faces. Silently asking each other; "Did he just say that? Really?" 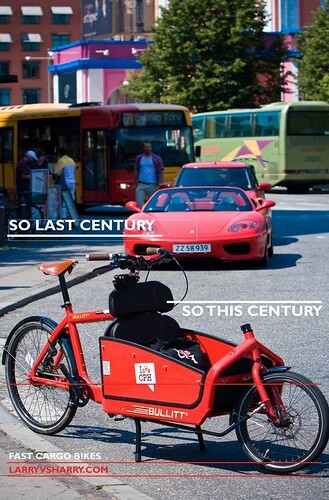 Here on Copenhagenize.com we highlight the numerous examples of the car industry backing itself into a corner and angling their advertising to attack the growing armada of Citzen Cyclists in an attempt to maintain their market share, as well as promoting bike helmets to scare people off of bikes. It was refreshing and depressing to hear those nine words. Felix was busy with his Nintendo during the talk - fair enough when you're eight - but he did look up at one point and whisper to me, "Daddy... isn't it funny that he's talking about cars and you're here to talk about bicycles?" Well spotted, my boy. In the car from the airport, just after we had met, Bangle and I discussed various aspects of our respective fields. Bangle asked me two questions in the course of the conversation. Did I think that bikes should be registered like cars. I said no, as I've written on this blog. He asked an interesting question about whether bikes are the top-end of pedestrian traffic or the bottom-end of car traffic. I replied that bikes were the top-end of pedestrian traffic. Cyclists move faster than pedestrians but are capable of pedestrian-like movement and spontenaity. During his talk he referred to our conversation and added a bit of bike-bashing for good measure. He mentioned the top-end/bottom-end question and suggested that cyclists want to be both. Delivered with a crooked smile and roll of the eyes expression on his face. He also chucked out the line that "somebody has to pay for the roads". Something that the good people at the I Pay Road Tax website/org would have a field day with. I approached him after the talk - we all went to the same restaurant - and mentioned this myth about 'paying for roads'. "Oh, I know..." was the reply. So he knew... but still chucked out the line to the audience. Chris took it with a laugh but a whole bunch of the people at the table fired off text messages about this innocent but effective eight year-old bicycle advocacy activism. So. What is Personal Emotional Mobility? The car industry would love you to mutter "oooh, baby" as your hands caress the carefully chosen material on your steering wheel and "Oh yeah..." as you look down the elegant slope of your hood. They want to trigger emotional reactions in people. All while those people are incarcerated inside their vehicles - completely and utterly cut off from the society in which they live. Isolated and alienated. It's no secret that the car industry has borrowed freely from the bicycle industry throughout the past century. No Henry Ford without Alexander Pope. No selling their products gorgeously without the massive success of early bicycle marketing. Et cetera. So here's what I'm doing. I'm plucking this catchphrase of Personal Emotional Mobility from the clutches of the car industry and planting it firmly in the blossoming garden of urban cycling. Because you know what the great thing about Personal Emotional Mobility is? It describes perfectly what the bicycle can offer the person who rides it. It is a brilliant description of what I, personally, get out of riding a bicycle in cities. My personal and emotional attachment with the cityscape, as well as with my fellow citizens whether on bicycles or on foot, is intensified, heightened. I interact with my urban landscape as I roll down the cycle tracks or streets of my own, or any other city. The bicycle is independent mobility and on it I am an integral, active and visible element in the city. Offering yet another human thread that strengthens the societal fabric. Thank you, Bangle. Thank you BMW. Your desperate attempt to sell cars has given me the perfect phrase with which to describe the beauty of the bicycle in cities. And you know what? We're changing the world for the second time around with our two and three-wheeled machines. Citius, altius, fortius.